ESI is an analytical tool that helps you quickly identify highly-cited research in your field. Ask us about training options for your organization. Have a product question? Search our Knowledgebase or open a support case with our Customer Care teams. Please share your feedback and help us improve this page. Make sure to include the URL of this page in your comments. If you're applying for grant funding or submitting a tenure portfolio, you'll want to be able to say something about the performance of your work. If your institution subscribes to Essential Science Indicators, you can easily determine if any of your papers are at the top of their field for citation impact. Top-performing articles, reviews, or proceedings papers will be flagged with an ESI Hot or Highly Cited Paper icon in Web of Science Core Collection, a research discovery database. This guide will give you background about Hot and Highly Cited Papers and walk you through the steps to find your own top papers. ESI Hot and Highly Cited Papers will display these icons in a Web of Science Core Collection results summary list. A limited number of document types and years are examined for the purposes of ESI. For a review of the ESI dataset, please visit the Learn the Basics guide. Highly Cited Papers are papers that perform in the top 1% based on the number of citations received when compared to other papers published in the same field in the same year. 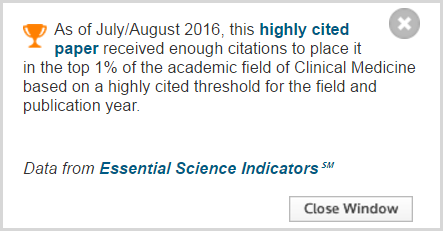 Click on the Highly Cited Paper icon for more details about an item. Hot Papers are papers published in the last two years that are receiving citations quickly after publication. These papers have been cited enough times in the most recent bimonthly period to place them in the top 0.1% when compared to papers in the same field and added to the database in the same period. To see whether any of your papers are Hot or Highly Cited, you'll need to start in Web of Science Core Collection. Conduct an author search to collect your own papers in the database. Check out our video on Author Searching in Web of Science Core Collection for search tips. Click on the ESI Top Papers refine option in the left hand panel (toward the bottom of the panel) to open it. If you have Hot and/or Highly Cited Papers in your author set of results, you'll see the option to refine to those top papers here. The numbers show you the number of documents that are Hot or Highly Cited. You may see this note: "None of the results contain data in this field." This means that you currently do not have any ESI Top Papers. However, ESI is updated on a bimonthly schedule, and new papers are designated as Hot or Highly Cited with each update.